The only reason we’ve listed the Diamond Infinite Edge Pro Compound Bow as a beginner bow, is that it’s quite affordable and offers a huge range of adjustable settings. Its amazing performance is not what we’d expect of an entry level bow. The upgrade from the Infinite Edge, the Pro version has an extended draw length to 31” and a new cam system which results in an even smoother draw cycle, and is the key technology behind the bows amazing versatility. The smooth drawing cams do reduce the IBO speed slightly, however this bow is more than capable when large game hunting. The riser of the Diamond Infinite Edge Pro compound bow is machined aluminum with a reflex riser to boost power, and parallel limbs to reduce recoil. Amazingly, this bow weights only 3.2lbs which is the same as the considerably more expensive Carbon Knight made by Bowtech which uses carbon fiber in its construction. It’s easy to see why this bow is so popular. The bow is designed with an eccentric dual cam system, with both cams elliptical in shape. The movements of the cams are synchronized straight out of the box which assists with a getting perfectly straight shot. The Diamond Infinite Edge Pro even allows for a special setting which they have dubbed “Infinity”. This turns the Infinite Edge Pro into a zero let-off compound bow (similar to the Genesis bow) which is a great option when there is more than one person using the bow, and where everyone has a different preferred draw length. The Infinite Edge Pro has a published IBO speed of 310 fps, remembering this is an estimate only at the exact point of release, and will be impacted by external factors. For details of how we calculate Kinetic Energy at TheModernArcher, refer to our detailed Compound Bow Guide. Assuming we use the standard IBO settings (70 lbs draw weight, 30” draw length, 350 grain arrow), an arrow shot from the Diamond Infinite Edge Pro will possess approximately 67.4 ft-lbs of Kinetic Energy. Based on the KE Hunting Charts, this bow is suitable for even the Toughest Game (i.e. cape buffalo, grizzly, musk ox). The package is perfect for those to want to grab their new bow and start shooting straight away (don’t forget you will need some arrows!). Refer to our draw weight table when designing custom arrows for your bow, otherwise these arrows will be suitable for the Diamond Infinite Edge Pro. 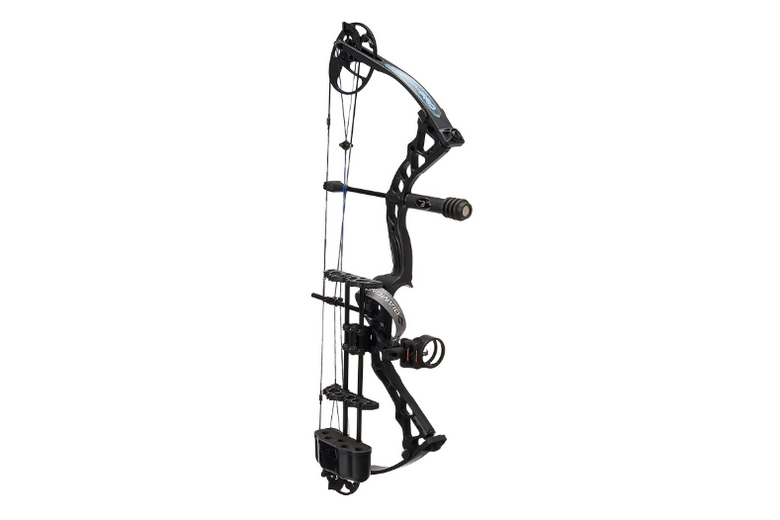 The Diamond Infinite Edge Pro is an outstanding compound bow at a very affordable price! The upgraded features have provided even more flexibility to larger archers and will allow youths to grow with the same bow. The dual cam design provides a smooth draw which helps beginners master their archery skills, albeit at the cost of some speed and stealth. This bow is wonderfully proficient at target archery but can be used for large game hunting as well, making it a great all round compound bow and one of our top picks. Buy Now!